It's all too easy to creep up and break the speed limit. Ford's new tech makes it impossible to do so, so you can focus on watching the road instead of constantly checking your speedometer. It's called Intelligent Speed Limiter, and it's pretty clever. It scans the traffic signs using a windscreen-mounted camera and adjusts the throttle to make sure you stay within the limit. Using controls on the steering wheel, you set the maximum speed limit beforehand, so you never go over 70, say. As soon as you enter a new speed zone, the car automatically adjusts its speed. It does so by restricting the fuel supply to the engine, rather than applying the brakes. If you're travelling downhill and exceed the speed, an alarm will sound so you can step on the brakes. The sensor reads road signs, registers the info, and even alerts the driver, just in case you were too focussed on the road to notice. And its integrated mapping data knows when a new speed limit is approaching, and gives you warning. Transport for London wants the national speed limit cut to 20mph in the capital's busiest roads. Ford's tech would make this more achievable. It would also work abroad, where it can be tricky to convert kilometres per hour into miles per hour and vice-versa. The tech itself isn't new. But it's the first time Ford's Adjustable Speed Limiter and Traffic Sign Recognition technologies have been combined to work together. 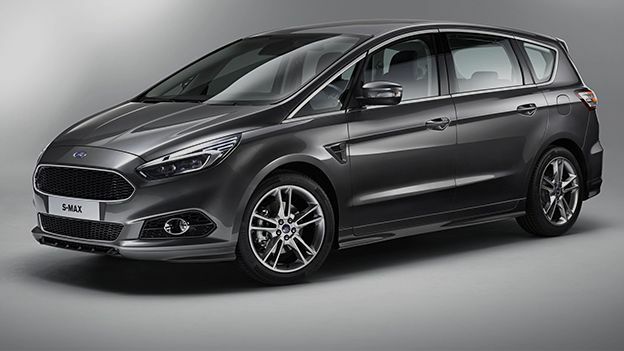 It will debut on the Ford S-Max, which is available to order now. The car's other tech includes detecting people in the road and applying the brakes if the driver doesn't, and Glare-Free Highbeam headlights that don't dazzle oncoming drivers.